Last year, anime girl and virtual YouTuber Ai Kizuna made a name for herself online. Now, a slew of other virtual anime YouTubers are hoping to do the same. 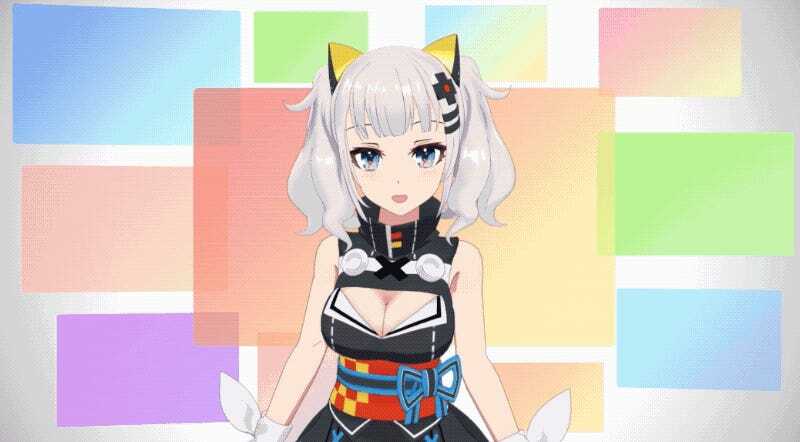 The virtual YouTubers are made with animation software, with their creators controlling and voicing 3D models. With a million subscribers, Ai Kizuna might be the most successful virtual YouTuber in Japan at the moment. When Kotaku first profiled her last spring, she only had 200,000 subscribers. Sometimes when she games, she drops f-bombs—as we all do. And here she is ranting about wide-ranging things, including the iPhone X.
Ai Kizuna is facing new competition from an increasing number of virtual anime girl YouTubers. Of course, there is room for other virtual anime girl YouTubers! The most formidable is Luna Kaguya (below), who already averages about a million views for her vids. Not bad considering she only debuted last month. Other popular virtual anime girl YouTubers include Mirai Akari, who has nearly 350,000 subscribers and has hit 23 million views. Other newly-minted virtual YouTubers aren’t hitting these numbers yet, but there might be a breakout star in the 2018 freshman class. Meet Shiro, another virtual anime girl YouTuber. Aoi Fuji isn’t much of a streamer, but instead likes to cover songs. Yua Fujisaki is a high schooler who joined YouTube last fall. Virtual Kitsune Musume YouTuber Ojisan (“Uncle Virtual Fox Daughter YouTuber”) has also been building up a following of over 180,000 subscribers. Reiden Kasuka, a yurei, is another new virtual anime girl YouTuber. Make that a ghostly virtual anime girl YouTuber. Here’s Norakyatto, a virtual anime cat girl YouTuber. Zombi-ko, a virtual anime zombie girl YouTuber. Kite Amashita is a virtual anime boy, who recently debuted. Since virtual YouTubers provide a way for camera shy types to participate, expect their numbers to only increase in a very real way.